Added around 350 new house furniture textures and re-categorized the existing ones. Improved the dialog navigation of the furniture system tremendously. Decimals can now be used in /calc. Admins can now use '/afrespawn all all' to respawn every unoccupied faction vehicle on the server. Added /togtips which can be used to toggle the help messages. Added /togaudiostreams which can be used to toggle most audio streams. Removed the gunrack slot requirement from /gunrack take, renamed some parameters and optimized the command. Some weapons stored in gunracks needed to be deleted, unfortunately. Removed the fines for having drugs when a player is hospitalized. Business managers can now use /requeststock, edit actors and will no longer be charged entrance fees. The lock status of house furniture doors will now save after server restarts. /ram can now be used on house garages. Renamed /d to /dr to prevent accidental uses of the command. Added a /light command which can be used to disable house interior lights at night. /ame will now include the character name before the action. Fixed a bug where the instant buy option in /buyf did not charge the user the correct price. Fixed an issue where calling the mechanic hotline when playerid 118 was occupied would break the system. Fixed a sorting issue on the /buyfood dialog. Fixed a bug where editing a contact name could create a new one instead of editing the current one. Fixed a bug where phone calls wouldn't end when a player's phone died. Fixed /removealias for the SASP. Added /ranks so players can see all ranks in their faction. Added a confirmation dialog to the delete and reset options in the /clothing menu. Added a confirmation message for after players finish scrapping their cars. /repair 5 can now be used to repair a vehicle's lights. All payphones now have a unique phone number. Increased the length of punishment reasons in all admin commands. Players can now /give oil to each other. Players can now set clothing items they'd like to automatically attach when they login. Recovery prices of modded vehicles will now match their repair prices. Removed the automatic punctuation from the /s command. The hospital time has been lowered to 1 minute. The house furniture limit for non donors is now 150. Navigating to mall businesses will now set a checkpoint at the front door of the mall rather than the businesses inside. Added an alert for when a player's phone battery is low. Fixed a bug where /searchf and /buyf could be used while placing/buying an object, causing furniture items to become stuck. Fixed a bug where Elite Trucking and mechanic call details were blank. Fixed a bug where faction leader names would not load correctly. Fixed a bug where faction uber ranks had a chance to bug while the faction was loading. Fixed a bug where player phones had a chance to stay on when their battery ran out. Fixed a handful of issues with the SAN talkshow system. Fixed some issues with the ESU subrank occasionally not giving proper command permission. We here in Elite Trucking have decided to host an ''open doors'' day today (08/04/2016) at 9:30pm (( GMT +0 )). 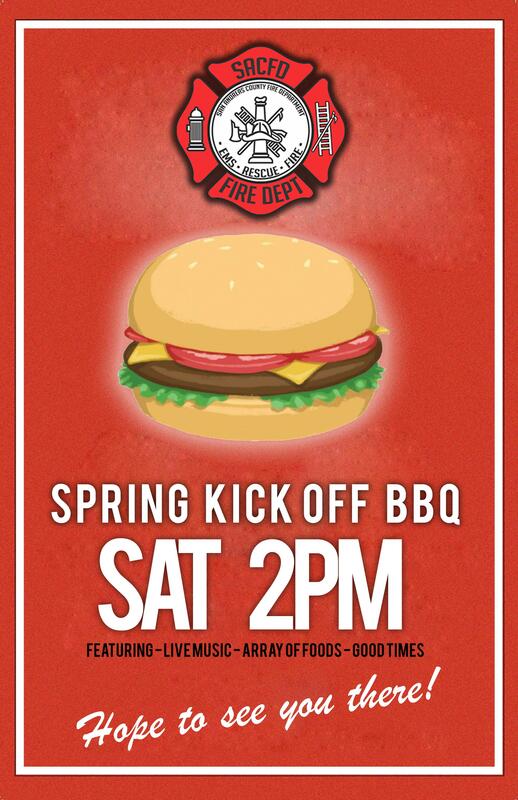 We will be showing our vehicles and there will also be a lot to do for the public. If you're interested in a career within our company, this is a perfect situation for you to get to know our departments and the people who work within them. This is also an announcement that Octane Springs will be blocked off public vehicles during this time and it has been confirmed by San Andreas State Police's Public Affairs. As we head into spring break we want to wish all of the visitors to the County safe wishes and hope they enjoy their break here. Secondly, for those Troopers breaking elsewhere we hope that your travels are safe and that yourself and your family have an enjoyable vacation. For those of us who unfortunately are stuck working, we continue to strive and perform to the best of our duties throughout this period. It has been a quite couple of months in regards to call activity and crime rates within Palomino seem to be quietening, which is something we have all been hoping for. We'd like to take this opportunity to apologise for the break in the Newsletter, with no newsletter being written for the month of February, as the usual writing team had a busy time towards the closing of the month, and we'd like to thank Captain Vincent Kemp for organising the bulk promotions. Engagement with the public is also on the rise upon request of previous newsletters, and civilian surveys and opinions of the Department are certainly improving. Special note to our Public Affairs team for that, who have been arranging multiple events and public announcements on behalf of the State Police. Finally, I'd like to take not of the decrease of traffic violations which is thanks to nothing but the continuous work of our fine Troopers patrolling the Highway, and for that we thank you. It was been another month where we have welcomed a Sergeant into the Command in Training scheme. Usually with three or four people going through the scheme, this time was rather special for Danny Remington. The High Command Team deemed him so appropriate for a Command position, he was invited to be part of this scheme, which has never happened before. The scheme has been a huge success so far, and the interview stage went fantastic for Danny and we were able to make him a Lieutenant CiT at the conclusion of it. It is at this point that we would like to say that Danny's training is over, and we have decided that he is suitable for a full time position as Lieutenant, and he will be given this position on a permanent basis. We'd like to thank Danny for his efforts in the Department, especially in the field of Criminal Intelligence and Field Training. The High Command team would like to congratulate Danny for all of his efforts throughout the scheme, and congratulate him on his promotion. Certain excellency awards are easy to come by over length of service, as there will always be tough situations for our Troopers to be part of, which granted, also deserves recognition. Service awards are also easy to come by, however there is one particular award which is the most difficult to come by, and takes recognition of your Troop Supervisor to obtain this particular award. As this is now going to be implemented monthly, I am going to take this moment to explain how it will work from now on. Your Troop Supervisor must nominate one person from his Troop at the end of the month, then, the Command Team have a nomination each, and it will go to a Command Team vote. The person who wins this vote will be given the Trooper of the Month award. This enables this Trooper to have a take home cruiser until the end of the month, and also will be given a cash bonus of 100,000$. So, to the Trooper of the month for March. It is very rare that you find a Trooper of this calibre, and this Trooper certainly fits the bill. A role model to his peers, and potential supervisor in the future, the award goes to Zachary Rogers. Rogers was also recently awarded with the highly prestigious Chiefs Award, which came with a 125,000$ lump sum ON TOP of his award for Trooper of the Month. Zachary Rogers is currently the only Trooper of the San Andreas State Police to ever be awarded the Chiefs Award, making this a very momentous occasion. We would like to pass on our congratulations, and hope you enjoy the benefits of this spectacular feet. Sergeants are arguably the most important ranking bracket when it comes to Patrol Operations. They are responsible for the day-to-day supervision of Troopers in the field, and are personally responsible for NCO bulk promotions. It is up to them, and their reviews of NCOs which determines whether or not a Trooper will be promoted. It is for these reasons that, at all times, we want the best performing Sergeants Team possible, hence why the current Sergeant in Training scheme is implemented. We'd like to congratulate everyone who has been taking part in the course over the past month. There is currently three people taking part in the 4 week long course, which is due to conclude on the 14th of April. We'd like to congratulate all three of them for completing their course, and becoming full Sergeants. As mentioned above, the Sergeants bracket is the most important, and those who excel within said bracket deserve nothing but praise for their efforts. It is difficult to move into a Commissioned Officer bracket, never mind progress within it. So those mentioned within the article are indeed special. 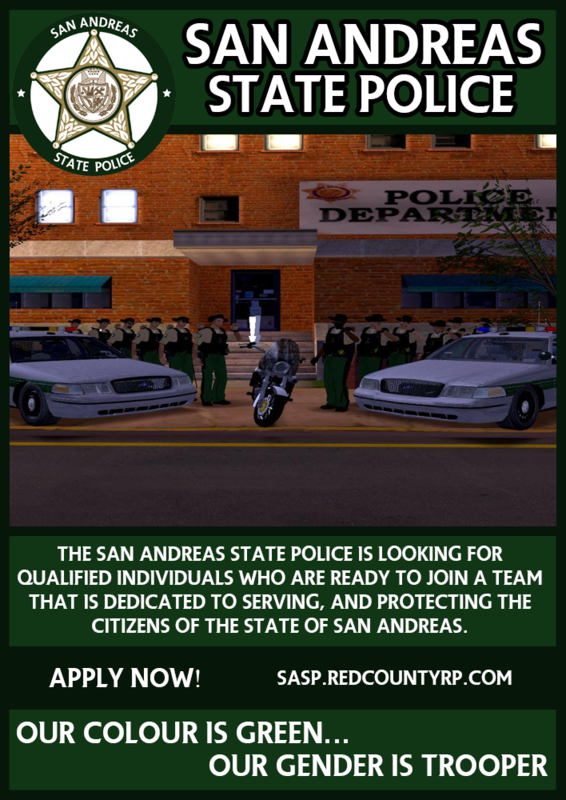 They are that one step closer to moving into the Command Bracket of the Department, and becoming a really important pillar of the day-to-day running of the San Andreas State Police. These are people as to which both junior and senior NCOs should look up to, and strive to be like within the Department. These Troopers are certainly what we would refer to as model troopers. Well done on a much deserved promotion, and all the best. Hughes Design is a house designing company that has initially started as an idea, a concept, and is now starting to become more and more known on the market, having projects after projects coming from all over San Andreas. Evan Hughes, the founder of this company, started as a junior designer for a company named Kappa Constructions and shortly after he has been handled his first real project, he lost his job due to the company being closed. However, this hasn't stopped the young welsh from following his dream. After getting a loan and using some of the money he had earned so far, he bought a small office in Dillimore and started advertising the company wherever and however he could. This company is aiming to bring a touch of style in everyone's house and make it stand out from the rest. Wherever someone sees an empty house, we see an opportunity to show what we are capable of and make the owner capable of calling it home. With unique ideas and creative designers, it's safe to say that it is aiming to be the number one designing company in the entire San Andreas. Given that the faction consists already of three designers, our next recruitment will be based on mappers, since we would like to spread the design concept on all fronts, that includes not only houses, but businesses too. If you think you have what it takes and fit the criteria, you're welcome to apply. m9Radio started in 2014 and has been around for two years now with various ups and downs, but what truly is Red County's ONLY radio station about? It all began with Montell", says Chief Executive Officer Sean Murphy. "He wanted to play music for parties, and stuff like that, so we said hey why not. We [m9Networks] will get into the DJ business". It is truly remarkable how far they have come in these past few years. From DJ's to Radio hosts, it is not an easy switch but they have made it. The radio station has even been sponsored by William Silver and Charles Smith. Not to mention that one of the original DJ's was Daniel Evans. "[Evans] was probably the reason we took off. We had about 30 people dancing in a park in Montgomery, we never thought it would even be possible to get three." [SASP] Academy Batch #33 is open! The San Andreas State Police would like to take this opportunity to thank everyone involved in the Saint Patrick's Day parade. We hosted a successful event on the 17th of this month, celebrating all things Irish with the parade. The parade was hosted by the State Police and included appearances from the San Andreas County Fire Department, Elite Trucking, and members of the public. As a successful event we hope to once again host more events like this. We were able to secure the use of a traditional Irish bar in Blueberry, where we ended the parade. With thanks to the Rat's Pack and all the management for use of their establishment. We also would like to thank videographer Noah Walker for providing us with coverage of the event. The event lasted around two hours and covered the bulk of the county. We at the public affairs unit hope that this will start a chain of events. We want to be able to host events like this on a more regular basis and attempt to provide a service back to the community that we have failed to meet in the past. If you would like to see the SASP host a event, please contact us using the details at the footer of this post. Young, coke slinging, scheming kids with a hunger for the American dollar regardless of what it takes to obtain it. This is the very basis of the young mobster in the mafia today, their motivation is money rather than the desire for power and respect, and they’ll do anything to get the edge over the competition. On the fact this faction may appear to be a bunch of young guys running around doing this and that, but in reality this is a very complex organization despite its small time vibe. Led by Lawrence Panarese, The Panarese Crew is the newest organized crime sensation on Red County Roleplay with a very firm focus on providing only quality roleplay and an even higher quality portrayal of the mafia. This faction provides the most realistic and accurate portrayal of the modern mafia, something that’s extremely evident in the structure, behaviour, and activities that can be found all over their thread and in game. There are no limits as to who can or cannot roleplay with The Panarese Crew, this means an African American or a Serbian could come and join this faction and have a spot within its ranks as long as they’re willing to work hard and put in the time and dedication necessary to be apart of something very special. All they ask is that if you’re going to roleplay an Italian you must use a proper Italian-American name, if your name isn’t considered a roleplay name you’ll be asked to name change or you will not be able to join, no exceptions. The ruling panel of the Panarese Crew considered their standard of roleplay to be extremely high, therefore they’re very selective throughout the recruitment process. This isn’t the type of faction that you can roleplay with and join in the same week, this is a very complex process designed to give those who are interested in the roleplay the opportunity to become a member rather than an individual who’s seeking access to guns or a title. If you’re looking for the rank and not the roleplay, this isn’t the faction for you. The Saint Brothers have been practicing their religion for a combined amount of 40 years. They originate from Vice City, Miami. Towards the beginning of March 2016, an unexpected arrival occurred and the Saint Brother's place of worship was destroyed and they decided to relocate. The place for this relocation, none other than Red County. The Saint Brothers quickly found a property in the Eastern side of Dillimore, where they set up their new and improved place of worship. Very quickly, members of the community came together and started to support the brothers in their efforts and wanted to join in on the cause. The Saint Brothers constantly welcomes new members, be it a brother who wishes to stay with us long term or someone who wishes to confess for only one term. All services are free in the eyes of the lord and are warmly welcomed by the brothers. The Yasadas Rebels are a group of innocent appearing hunters, fishermen and business owners of the Bone County region. They seem friendly at first, selling their regulated meats/poultry and driving their vehicles all over BC. Through out the nights, and silent times of the day. These Pirates/Bandits set out to attack the hard workers of the Bone County society. Stealing fuels from tankers, heists on boats to steal merchandise, as well as taking property from businesses. The main reason they do this is to make income faster than their legal way of selling meats/hunting/running slow businesses. As well as to get that sweet revenge feeling of how the "whites" have taken and destroyed what once was apart of the Native people of San Andreas. This group likes to associate itself in a both Native American/American way - praying to Gods and ancestors, giving blessings in campfire stories, etc. If you no longer have channel admin, look for any Teamspeak Administrator ( ) and send them one polite message to have your channel admin set. Alternatively, you can send Giga a forum PM along with the channel name and your client unique ID so he can grant them even if you are offline. You can obtain your client unique ID by pressing Ctrl + I. However, please take note that you still have to edit the channel yourself and fit them to the requirements.